This cow-like animal is a gayal or mithun. It is a domestic animal in South and Southeast Asia. This particular animal would be called a mithun because it has more cattle-like features than the ones called gayals. What exactly is mithun or gayal? That’s actually a pretty good question. The scientific name for this animal is Bos frontalis. It is in the same genus as the domestic cattle species, and like other members of this genus, it can hybridize with domestic cattle. Apparently, the hybrids between domestic cattle and gayal/mithun are more often fertile. There are three hypotheses for what the gayal/mithun actually is. It’s a hybrid between the gaur (Bos gaurus) and the domestic cow. It’s a domesticated animal that is closely related to the gaur that has since gone extinct. It’s a domesticated animal whose wild ancestor has gone extinct, and there has been a lot of crossbreeding between gayal/mithun with the wild gaur and domestic cattle. Some authorities think of the gayal and mithun as different entities. One would think that the literature would have cleared this up by now, but the literature is virtually everywhere. 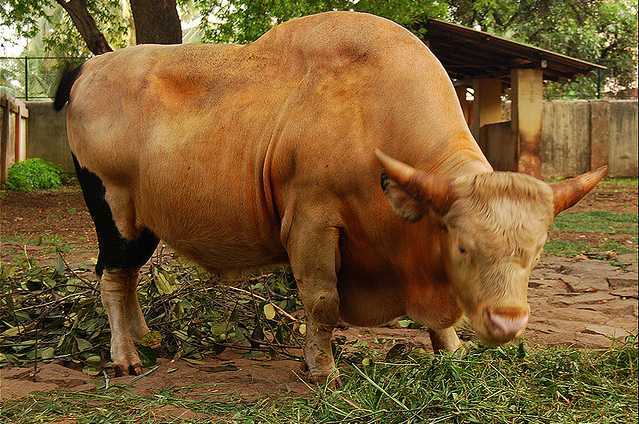 Different sources claim that gayal and mithun are different animals or that gayal are directly derived from gaur, while mithun are gayal/cattle hybrids. Such confusion is probably why we still hold this animal to be Bos frontalis. The latest research holds that the gayal and mithun are the same thing— and they are domesticated gaur. However, these domesticated gaur have heavily crossbred with both indicus and taurine cattle in some areas. More research needs to be performed in order to tease out exactly how much of which species contributed to its genome. It is correct to say that this animal is a gaur/cow hybrid, but it may be that not all animals have cattle ancestry. In fact, I’d be surprised if all of them did. If these animals are found to be predominantly gaur in ancestry, one would be more willing to question the validity of Bos frontalis as a legitimate species. The proper name for this animal would be Bos gaurus frontalis. But because virtually every study on these animals involves mitotchondrial DNA. we really can’t determine the exact contribution of the domestic cattle species and the gaur in the the gayal or mithun. So it’s a mystery animal. I lean toward it being a domestic gaur with some domestic cattle blood. But we need a larger n study that includes gaur, various types of domestic cattle, and mithun and gayal from different countries in South and Southeast Asia. It also needs to be a study that looks at nuclear DNA– just because mitochondrial DNA studies can be quite inaccurate.